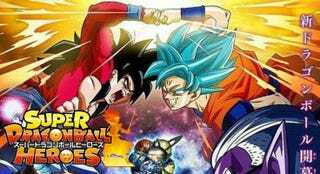 Toei Animation has revealed that they are working on an anime adaptation of the video game Dragon Ball Heroes. This anime, isntead of being a Canon continuation to Dragon Ball Super, it´s more of a series where everything goes (Nappa Super Saiyan 3, Adult Gotenks, Broly SSJ4 just to name a few). The anime will cover some of the new arcs of the video game and it will be shorter than Dragon Ball SUper and in another schedule since the Dragon Ball Super Timeslot is already covered by Gegege no Kitaro. Finally, here it is a little more than an hour of Dragon Ball Heroes openings.